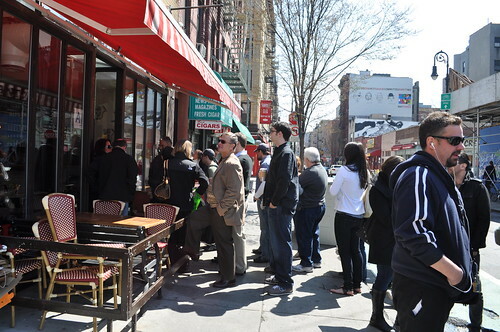 After attempting to have dinner at The Meatball Shop on Friday night (and arriving to a two-hour wait! 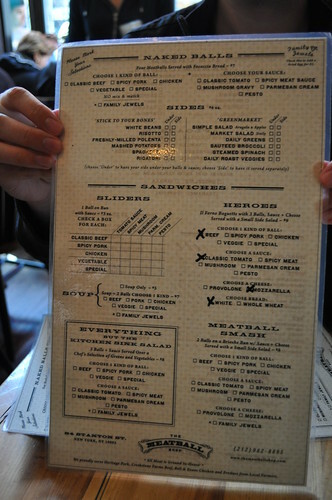 ), Marcus and I decided to get to The Meatball Shop fifteen minutes before it was open at noon for lunch on Saturday. Erin and my co-worker, James, recommended this little meatball joint to us, so we thought we'd pay a visit to see if it lived up to all their hype! This was the line at 11:55 AM! Luckily, we were the third or fourth party waiting in line already. 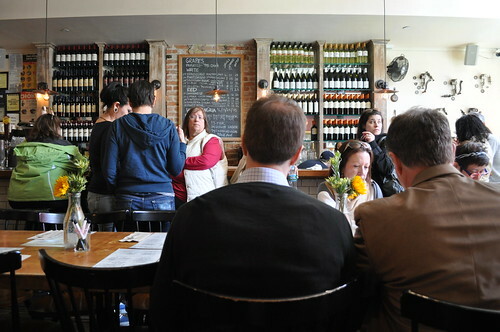 As the doors opened, people were piling in and tables were being taken so quickly. Marcus and I pretty much made a mad dash to our table. This is the long table in the middle of the dining area. All seats are quickly being nabbed! Behind the table is the bar. I like the brick wall and the shelves of wine. The entire restaurant filled up in a matter of minutes! 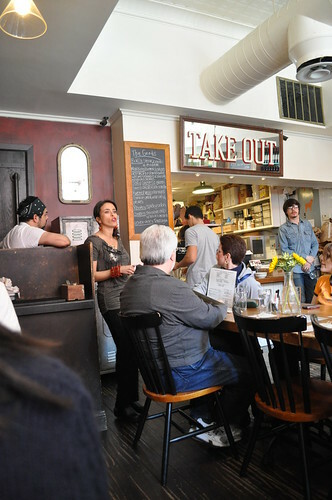 Once all the opening guests were seated, one of the waitresses gave a brief overview of The Meatball Shop's menu, how everything works at the restaurant, the daily specials (on the chalkboard behind her), and what she recommends. 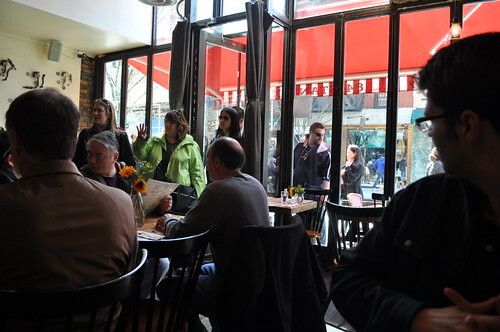 Just a little bit of background on restaurant--per the co-owners Michael Chernow and Daniel Holzman, The Meatball Shop focuses on "simplicity and deliciousness" (amen to that! 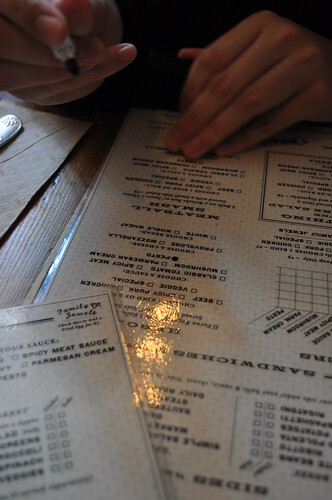 ), as it was created as a "ballistic, choose-your-own-adventure food journey." They want the restaurant's patrons to "enjoy the menu on their own terms, eat simple, eat sustainable, eat good food with no strings attached." That's some pretty good philosophy right there! 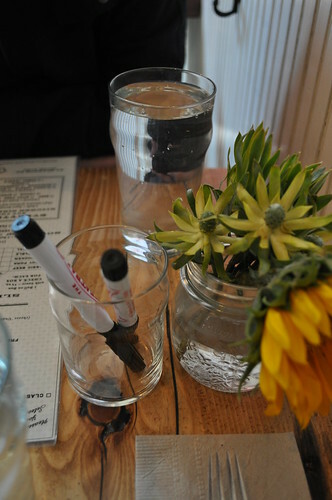 They take your order at The Meatball Shop by filling out the laminated menu with an erasable marker, seen in the glass above. You then go to the section of the menu where you wanna order from (e.g., naked balls, which are just meatballs served with a side of focaccia bread; sliders, which is one meatball on a miniature bun; heroes; and the meatball smash, which is served on a hamburger bun; "Everything But The Kitchen Sink" salad, which are just meatballs over a bed of salad and vegetables) and mark off the kind of ball/sauce/cheese combination you wish to have. Think of all the combinations you can toy with during future visits! There is also a section of side dishes from which you can order, where you specify whether you want it under your meatball order or on the side with your meatball order. This is how I marked my menu! The whole menu seen here. 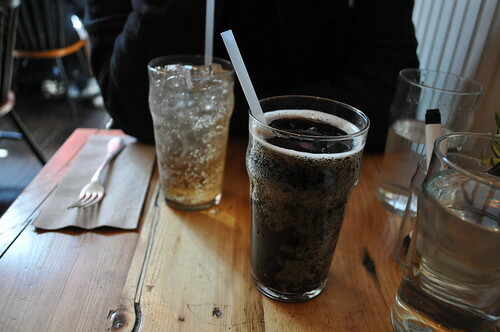 For drinks, Marcus went with cream soda, and I went with Akita root beer on tap. Both are great choices if you're taking the non-alcoholic beverage route. Since my root beer was on tap, there's no ice in the glass! This was the hero I ordered with the classic beef meatballs (three made with Creekstone all natural beef ground, prosciutto, herbs, and fresh ricotta), classic tomato sauce (just like Grandma used to make--advertised on their menu), and fresh mozzarella on a toasted II Forno white baguette. 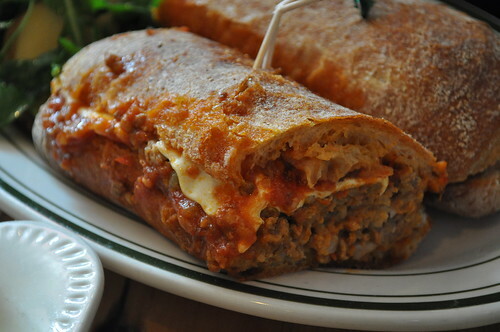 It was the ultimate meatball hero that one is always in search for--freshly made meatballs using quality beef and herbs smothered in classic Grandma-style tomato sauce with the perfect layer of melted fresh mozzarella on top, all captured in an oven-toasted baguette with that delicious, crackly crust. 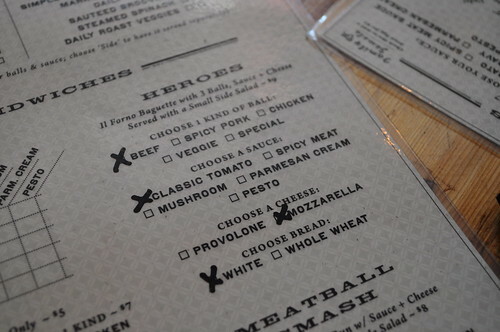 I like that The Meatball Shop uses fresh mozzarella in its meatball heros--it adds another dimension of freshness to it. 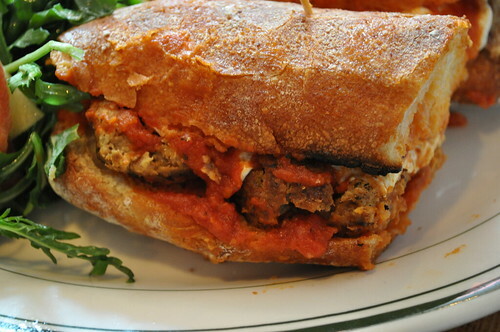 I can undoubtedly say that this may be the best meatball sandwich I've ever had! Per Erin's recommendation, we HAD to order the mashed potatoes. I'm always up for mashed potatoes so it wasn't much of a problem for me or for Marcus to order this as a side. 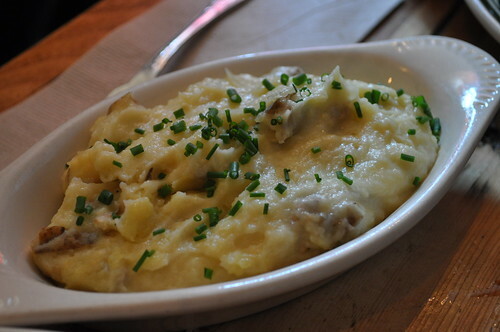 All I have to say is that the mashed potatoes were, in fact, amazingly awesome. They were creamy yet still lumpy from the potatoes and sprinkled with the added flavor of chives. The best part about these mashed potatoes was that they were made with the skin still intact, adding a more rustic, homemade feel to them. Ahhh, I'm dying to go back for this! Marcus had the hero also but with the special meatball offered that day (i.e., three made with steak, bacon, and cheddar) with the spicy meat sauce (made with Heritage pork braised in chiles and tomatoes) and mozzarella cheese on a toasted II Forno white baguette. Marcus said that he felt like the meatballs were a lot softer than he had anticipated where it seemingly tasted like an Italian-style hamburger. He liked that it wasn't overpowering in any way (meat-to-cheese-to-sauce ratio was a successful combination). He also thought the portion size of our meal was just the right amount, where after finishing it, we had reached the optimal "hit the spot" point. This is something I call the "Goldilocks Effect" whereby the said ingredient ratio along with portion size are each at its most favorable state in the dish/meal/course at hand (aka, everything is "just right," per Goldilocks in her fairytale story). I stole a bite of this from him, and I thought the steak/bacon/cheddar tasted like the toppings to nachos or potato skins. It was really good, and the sauce was only mildly spicy (for the bite I took, at least). Findings: The Meatball Shop is certainly worth every penny (what a great deal--an amazingly delicious, generous meatball hero at under $10!). I love the fact that you can "make" your own meatball meal--not limiting you to just the classic meatball sandwich (which is still great). 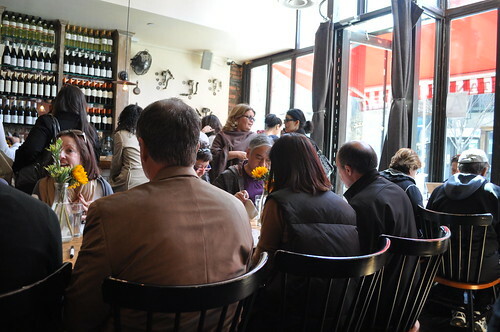 Customization is truly embraced at The Meatball Shop, and that's what keeps its customers so loyal--top quality ingredients and lots of variety so there is the opportunity to switch up any order if you felt like it. Eating on your own terms, especially when it's not a fast food establishment, is very refreshing. Plus, since the "Goldilocks Effect" is very much applicable at The Meatball Shop, you get meatballs, your way, in the most "just right" way it could be! 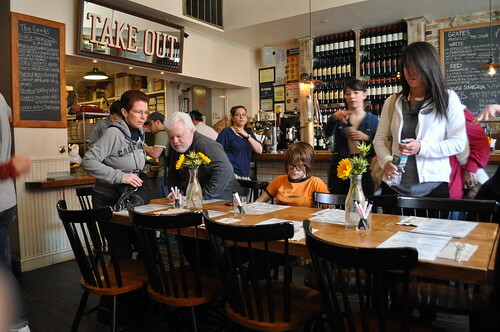 I would love to go back and try the freshly-milled polenta (James has been hounding me to do so) as well as to try the mushroom gravy sauce (i.e., mushrooms and onions stewed with chicken stock), any future special offerings on the daily menu, and the ice cream sandwiches! On the prime late-night days (i.e., Thursday, Friday, and Saturday), The Meatball Shop is open through 4 AM (through 2 AM on the other days of the week) serving the full menu from lunch starting at noon. Can you imagine having one of these meatball heros after a great night out? Sounds like the perfect hangover food! I'm looking to my many future visits! Anyways, I would advise getting here early for dinner (and avoid the two-hour wait that Marcus and I came across at 8 PM on a Friday night) and lunch (arrive 15-20 minutes early to make sure you're one of the first groups in line) if you don't want to wait! And even if you end up waiting, I promise it's worth the wait! The meaty goodness that is behind these doors is always worth the wait. Price point: $9 for each meatball hero, $4 for the side.